Young entrepreneurs doing something for themselves and fulfilling a need instead of waiting on governments to provide mediocre jobs so they can survive I always will support 100 percent. 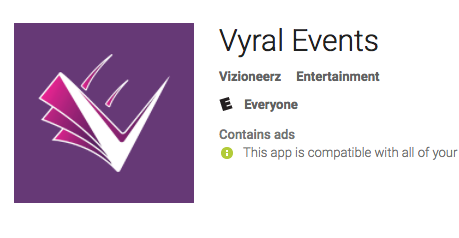 Came across this app from reading a Gleaner Article on April 16, 2017, titled Mobil App For Party Fans – ‘Vyral Events’ Links Promoters And Patrons In Cyberspace. Love the App tour – Was a welcoming feature that let me know what to expect when using the app. Short clear and to the point. Open to feedback – Listening to your users and giving them an avenue to be heard even if you don’t use it is refreshing. Social Sharing, Location and Ticket information were easy to find and follow. Great shopping cart experience always pushing for me to add to my cart or view your events offering. The dashboard shows weather possible using iconography instead of text to tell the weather could be a good change. Feedback icon tricked me – Thought it was a messaging service. Solution possibly use a universal feedback button ex thumbs up/down could do the trick. For events you aren’t selling tickets for Example Movies. Would be nice to be directed to Palace Amusements to purchase there. Registration with Facebook and Instagram are good just personal preference to use Google for my apps maybe version two could include that as well. Overall and definite go to for me when I want to know whats going on. They seem to be very up to date with events and latest technology thinking no dead ends, crisp vivid imagery. I think its on par with international apps Eventbrite, IslandETicket and TicketPal. Visioneerz I see great future for your product so one advice to you guys, users sometimes forget about apps so use push notifications so you are always relevant and remembered. Secondly let me do my part. If you havent downloaded yet get it here.